As a talented and hardworking independent graphic designer, Jordan Wong has already made an impact on the city since moving to Cleveland from Pittsburgh just two years ago. 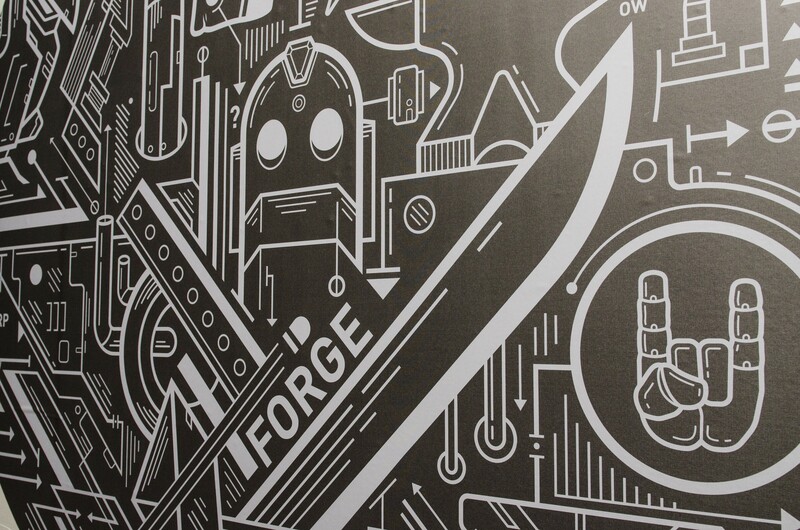 Within months of arriving Cleveland, Wong landed a position at Cleveland’s Go Media, and was immediately tasked with branding the company’s annual Weapons of Mass Creation Fest, the region’s premier conference on graphic design and illustration. Not one to rest on his laurels, Wong soon decided to pursue a freelance career. Shortly after leaving Go Media, Wong began renting studio space at Canopy Collective, and made a deal with owner Erika Jaenke to design promotional material for Canopy’s many events. Wong still maintains a studio at Canopy, and continues to produce their promotional material, as well as several other happy clients. A graduate of California University of Pennsylvania, Wong lived in Pittsburgh for twenty years before moving to Cleveland. Influenced by cartoons, Wong’s mechanical aesthetic is enhanced by hints of comics, video games, anime and manga, as well as his witty sense of humor. As a second-generation Chinese American, Wong uses his connection between cultures as a launching point for his artwork, combining elements and influences from both his Chinese heritage and American upbringing. This summer, Wong’s work will be on display at three local establishments: Lava Lounge in Tremont, Rising Star Coffee downtown and Phoenix Coffee in Ohio City. Intentionally selecting non-traditional exhibition venues, Wong prefers to present his work in a more casual setting. The first of these exhibitions is currently on view at Lava Lounge, and can be seen during Walkabout Tremont the weekend of Friday, July 14. 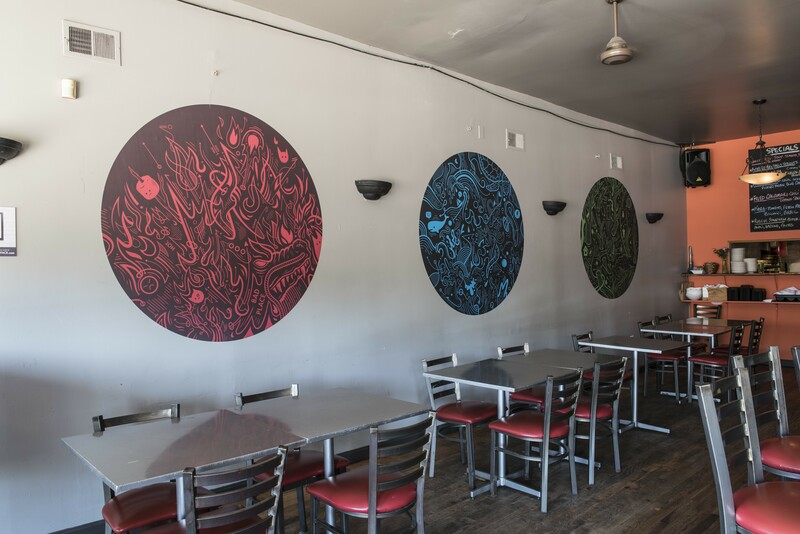 Unlike the typical artwork hanging in the bars and restaurants throughout Tremont, Wong’s Five series was specifically designed for Lava Lounge. While most artists hang work in restaurants and coffee shops without much thought to its setting and presentation within the venue (hoping it will be a temporary location before being purchased), Wong’s Five series thoughtfully responds to the unique characteristics of Lava Lounge’s first floor. The series is inspired by Wu Xing and the Five Elements in Chinese culture. Each of the five illustrative wall graphics in the series references one of these elements, and each of the circular compositions features a color related to its element: earth (orange), water (blue), wood (green), fire (red) and metal (gray). Wong even went as far as to color-match the orange and gray to the wall to which each element is mounted. Although the five pieces at Lava Lounge appear to be the same size, Wong shortened the diameter of his Earth piece to accommodate the high-top table under it. The Five series is available for purchase through Wong’s website (wongface.com) as either a 12 in. by 12 in. framed print or a full size “Photo-Tex” wall graphic. The Five remains on view at Lava Lounge through the end of July. Later this month, Wong debuts his entire Harmony & Hoopla series for the first time in Cleveland at Rising Star Coffee Roasters’ downtown location. Wong originally debuted the series in Pittsburgh earlier this year, and three of the works from the series were featured in the $50 Show at E11even 2 earlier in March. Inspired by the Surrealist’s concept of automatic drawing, the Harmony & Hoopla series features illustrations that combine non-objective mark making with recognizable imagery. Since first being introduced to automatic drawing, the process has become a large part of Wong’s aesthetic style. Harmony & Hoopla will be on view at Rising Star beginning on Saturday, July 22, with an opening reception from 2 to 6 p.m. Wong’s work remains on view at Rising Star through August. Beginning on Saturday, Aug. 5, a collection of Wong’s framed t-shirt designs will be on display at Phoenix Coffee in Ohio City. A precursor of sorts to his Five series, these designs include imagery and themes that again connect Jordan to his heritage. The designs include many witty symbols and references, but the imagery is appealing regardless of one’s knowledge of these sometimes-esoteric undertones. Phoenix Coffee in Ohio City hosts a reception for Wong from 4 to 7 p.m. on Aug. 5. For more information on Jordan Wong and his work, visit Wongface.com. (Lava Lounge) 1307 Auburn Ave., 216-589-9112. (Rising Star Coffee Roasters) 412 Superior Ave., 216-600-5820, risingstarcoffee.com. (Phoenix Coffee) 3000 Bridge Ave., 216-400-7901, phoenixcoffee.com.